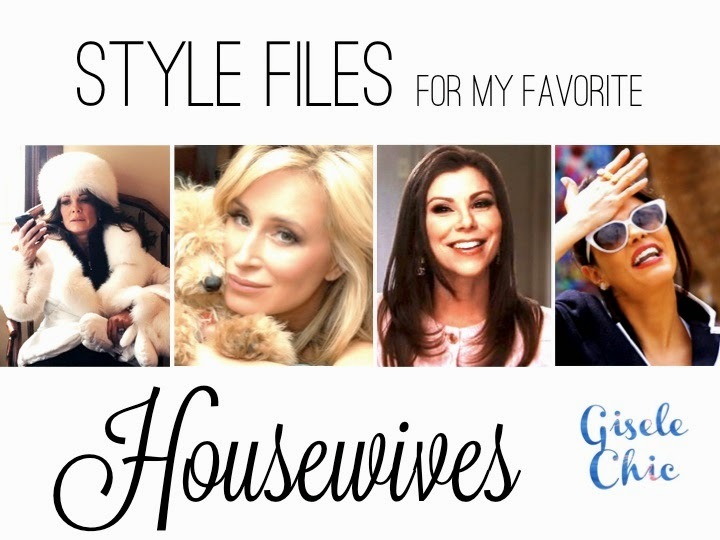 My guilty pleasure has been revealed; I am obsessed with the housewives franchise (and Bravo in general)! Whatever city, whatever drama, whatever dull story-line, I mean putting a gossip magazine in a travel bag, really? That's like an essential travel item... All the housewives bring something great, but, I do favor some over others, all for different reasons, and these four gals just have great taste! 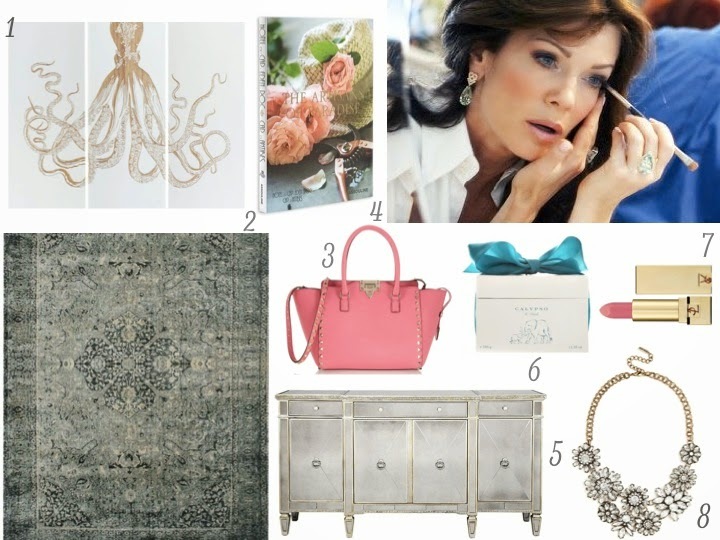 Here are my style sets for Heather Dubrow, Adriana De Moura, Lisa Vanderpump and Sonja Tremont Morgan! Enjoy! Heather is classy and fabulous, just like Coco Chanel intended. She drinks Champs and for some reason I can't really fit her too far into the typical Orange County lady. If I really had to label her it would be WASP with some Southern Charm. She dresses very well, albeit safe. Love her and all the classic looks she embraces, for some reason I really like the dark blue hues on her. I would be shocked if she didn't have this Van Cleef and Arpels watch, drink Veuve and send perfectly prim snail mail. A Bottega Veneta clutch is so Heather, simple design, pristine attention to details. Cheers! Adriana!! Everyone has got to love this girl, she just says it like it is! Hilarious, flamboyant and she wears bright, beachy colors. I think she represents Miami well, capturing all that exuberance in her style and personality. I have very similar agate coasters, but these Calypso ones take the cake with a wonderful gold trim. I think her house has lots of neutrals because it's filled with beautiful art and on a dock by the water, so I could see her having a really serene rug like this metallic Cowhide version. If you know me, you know I love orange and these Jimmy Choo heels would not only look amazing on Adriana but add such a perfect pop of color to any simple day outfit. I am thinking like boyfriend jeans and a nautical striped sweater and walla, instantly chic and simple. 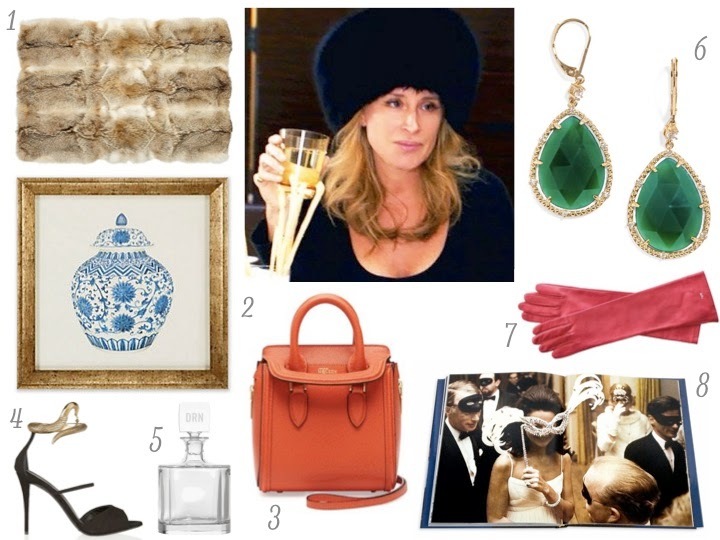 No need to explain the Edie Parker flamingo clutch, just couldn't leave that one out! 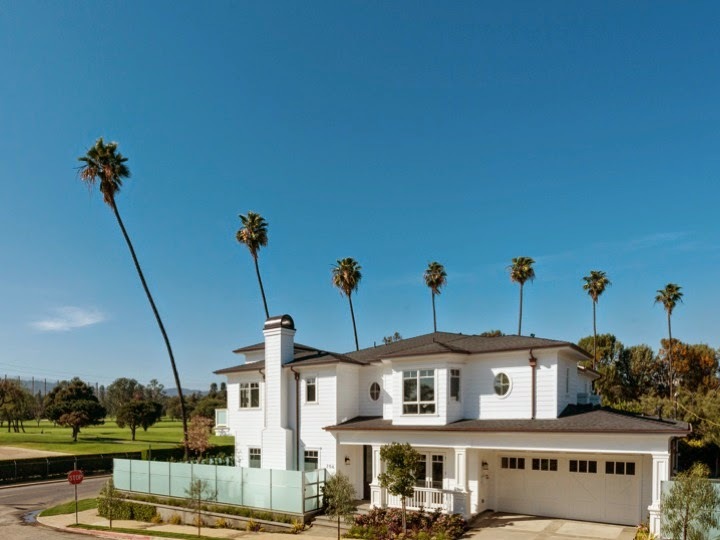 So I have been passing this house on walks, runs and drives down Montana St. in Brentwood, right near the border of Santa Monica and I am obsessed. 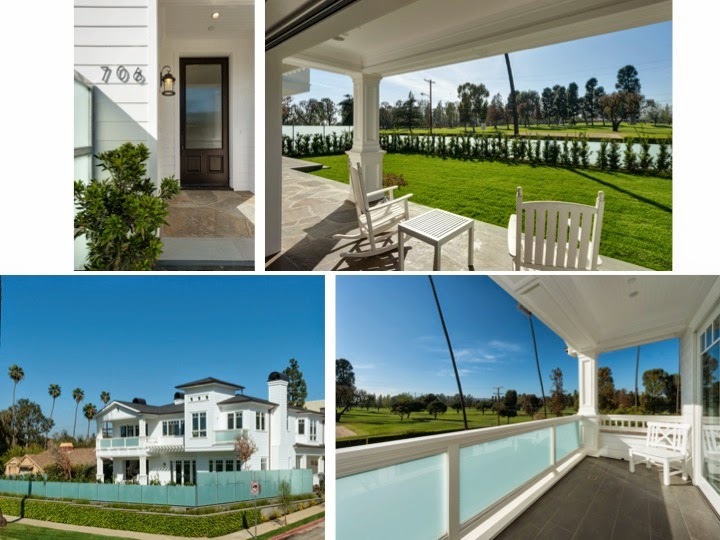 It's a beautiful, newly constructed, contemporary traditional conveniently located across the street from the Brentwood Country Club. 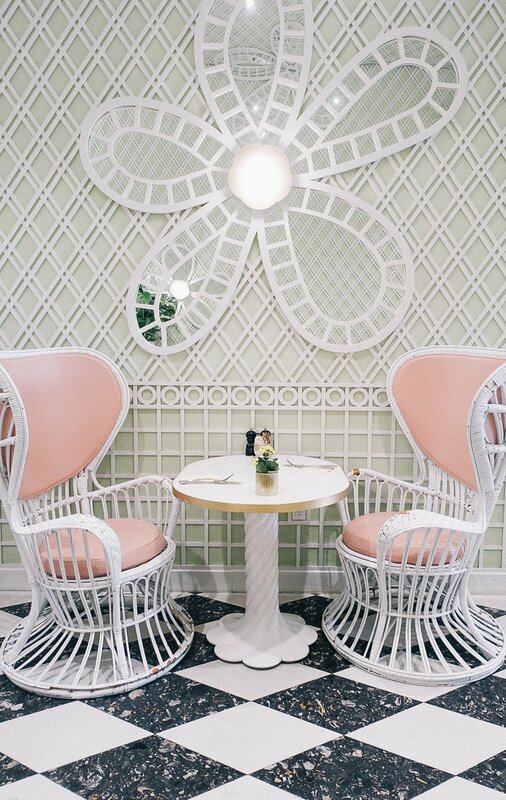 It's so east coast meets California, meaning you can sit on the porch feeling summery year round! Its' brand new and ready to move into; all for just a little under 5 million! Takers? Enjoy! The only thing I would change about this property is the blue glass... sorry but I just don't think it fits at all! It's so modern and takes away from the green grassy landscape that surrounds the house. I would do an ivy filled fence instead, one that hits just about half a foot higher then the blue glass border. 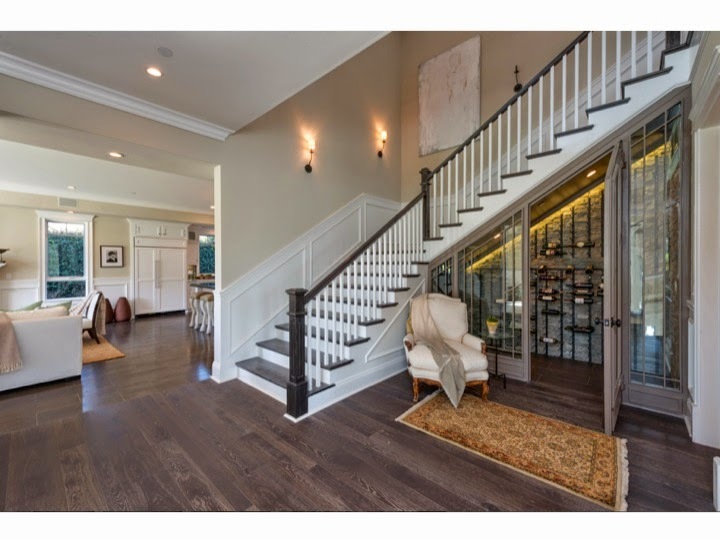 Porches are quaint, but a wine cellar is just downright practical... This one takes the cake! And the staircase isn't bad either! I am assuming the house was staged with furniture for showings, so I won't comment on the decor. The fireplace is great but I think it could be a bit wider. The glass doors on the right lead out to the long simple porch and I would like to see a slightly clearer path toward it with some outdoor furniture to align with the inside space. The large and open window off the family room is show-stopper! I'm sure whatever interior designer scores this house will be quick to make it a focal point, hence move that couch out of the way! 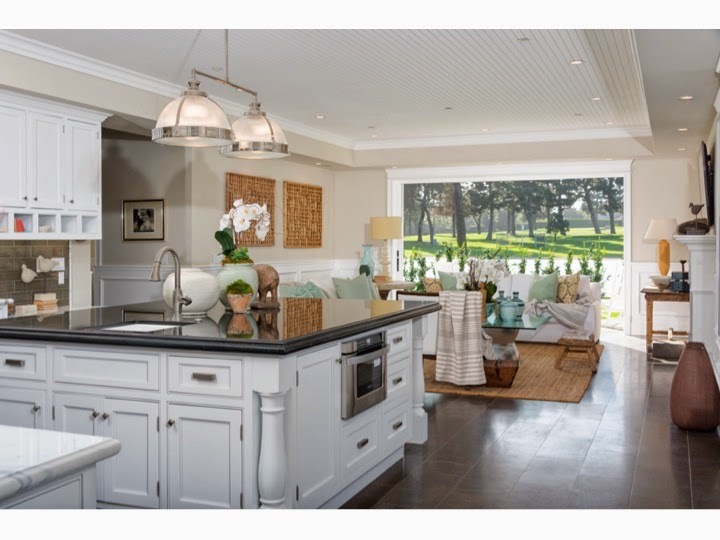 I love how California homes have open floor plans like this, especially in the kitchen/family area! We are Americans and no matter the size of the kitchen, we will all end up standing around, eating, drinking, chatting, flattering, etc! Stunning master bathroom!!! And we haven't even seen the full size tub and stone shower! I just love this open space and all the white marble. It's easy, breezy and doesn't need much decorating. 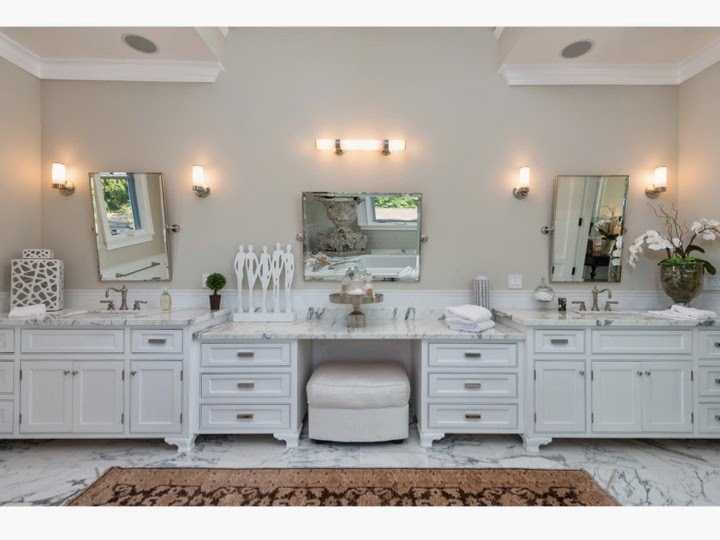 I think bathrooms should be clean and simple; the beautiful marble can do the rest! Can you imagine the ideas this space would inspire? It's just so ready to be made over, I would even consider a bit of paint on the top wall space, and perhaps a collage of frames. The natural sunlight in the space is key, makes everyone feel bit more free and connected to the world. That's why I love my desk so much, it's white and sits next to a large sun filled window, perfection! I must admit, before this fabulous nail salon opened, I was certain the space would be a wonderfully new and trendy French eatery in Brentwood... 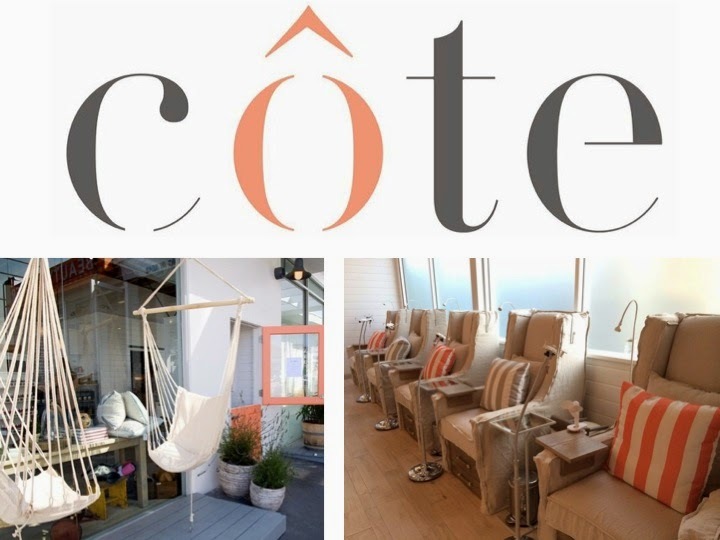 When Côte debuted as a beachy nail salon and shop, I was pleasantly surprised! Although I pride myself on getting $20 mani/pedi's every two weeks down the street, I will say, this place might be a game-changer. 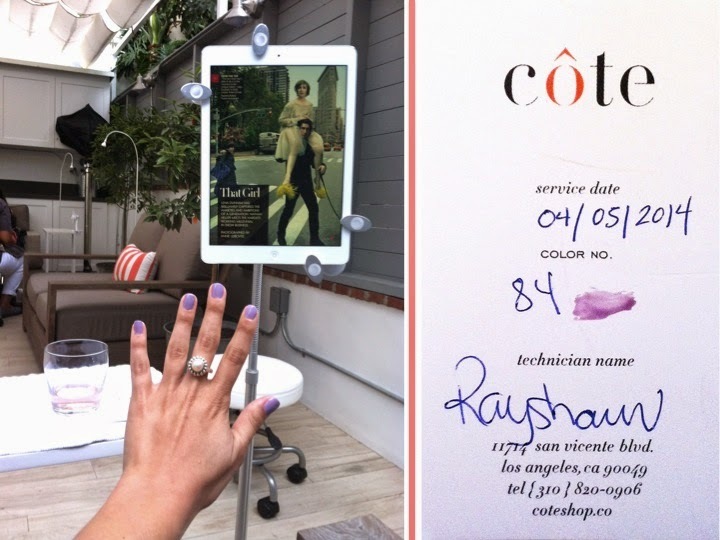 Yes, we have seen some other luxury nail salons around Los Angeles, but this one stands out! The whole look is so incredibly summery, like summer in the Hamptons! First off, this salon is a shop too! 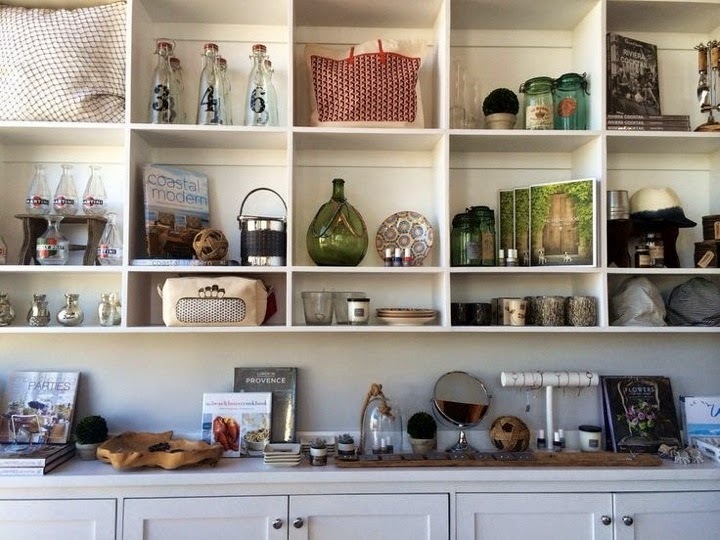 With tons of beach house products and cute trinkets that would made for great gifts. 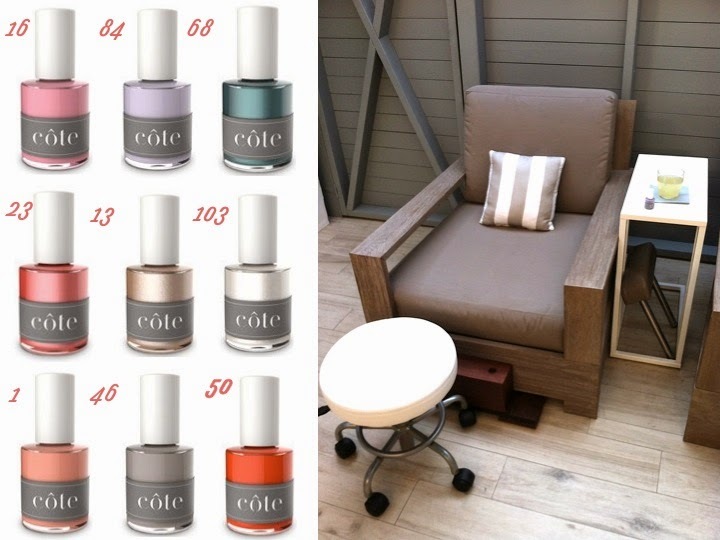 Second, they use their own nail polish line, which is five-free, meaning free of the five main toxins found in most nail polishes. It's also considered a vegan product by the FDA! Below are some of my favorites! Most importantly, I felt as if I was in the Hamptons, sipping on Lemonade and Rosé in an open patio with all the wonderfully natural sunlight! To top it off, I was able to catch up some Vogue on a super convenient iPad propped up perfectly next to me. At the end my wonderful technician gave me a little notecard with the polish she used, how thoughtful! I will definitely be coming back, especially for that luxxe pedicure just screaming Monica we neeeeeeed this!! !